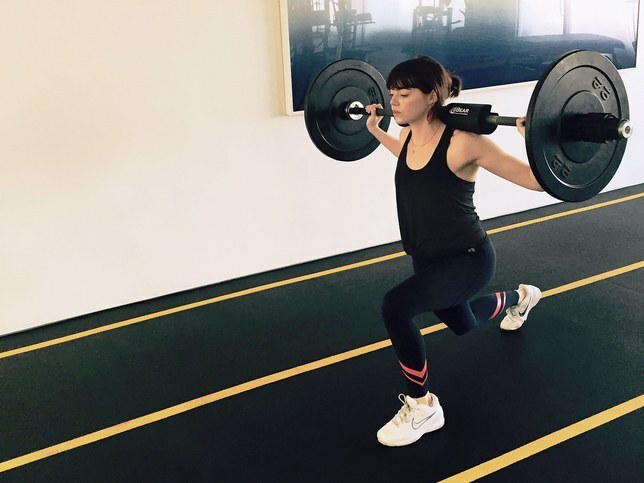 In this week’s WednesdayWorkout, we look at Oscar-winning actress, Emma Stone, and how she got in shape ahead of her new film ‘Battle of the Sexes’. In her new role as tennis legend Billie Jean King, Stone had to bulk up, and put on 15 lbs of lean muscle by weight training twice a day. Her training also included bodyweight training, cardio and exercises such as pushing a 200lb (90kg) sled and deadlifting 185lbs (84kg). An alternative to barbell deadlifting but equally effective exercise, that Stone’s trainer Jason Walsh gave her, is using Kettlebells to deadlift instead. A kettlebell deadlift targets your glutes, legs, arms, abs and back, just like a barbell deadlift. If you can’t get hold of barbell’s, kettlebells can therefore be a perfect equivalent! To do so, stand with the kettlebell between your feet on the floor. Squat down and grab the kettle bell with both hands while the back remains straight – do not slump your shoulders! Engage the core and keep the arms extended and straight as you stand pulling up the kettlebell. Do these exercises for 20 reps and repeat 5 times. Emma Stone’s training routine was paired with a protein packed diet, where she would have a protein drink to recharge after each workout. A high protein diet ensures her muscles repair after her training and continue to grow! Through a high protein, balanced diet and weight intensive training regime, Emma Stone was able to get into character as a famous athlete and sporting icon!